WASHINGTON—If GOP President Donald Trump and his Wall Street backers convince Congress to privatize the U.S. Postal Service, youthful postal clerk Arrion Brown of D.C., a Postal Workers activist, says he may get laid off and have to find another job to support his two young children. If Trump’s plan seeks to cut costs, retired Postal Worker Grace Jenkins says, “they’ll want to stop us coming to your house every day” to deliver the mail. The privatizers – Wall Street – “would cut service and deliver only where it’s profitable,” adds Letter Carriers Secretary-Treasurer Nichol Rhine of Branch 8 in Lincoln, Neb. As a result, the postal unions – NALC, APWU, the Mail Handlers/Laborers and the Rural Letter Carriers – would wind up fighting for members’ jobs, says Rhine. And retirees’ pensions, too, adds Jenkins, of APWU Local 0140 in Southern Maryland. And several other people said their unions would be the first target of the privatizers. 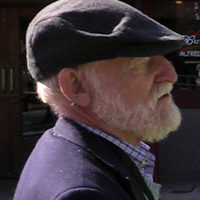 Besides, “the cuts affect me, too, as a customer,” retiree Jenkins comments. All those ill omens led tens of thousands of people – unionists, their allies, postal customers and some lawmakers – to rally nationwide on Oct. 8 against Trump’s privatization plan. Trump will officially and deliberately release it after release after the mid-term election. Close to 100 people, including not just postal union workers, but members of the Teachers, the Communications Workers and National Nurses United, showed up just blocks from the White House to protest Trump’s privatization plan. Thousands more rallied in New York, Chicago, Los Angeles and cities ranging from Anchorage to Miami to Honolulu to Bangor to San Diego. The 200,000-member Postal Workers organized the events nationwide, while the 200,000-active, 80,000-retiree Letter Carriers and other unions joined in. Many of the workers and their allies massed outside offices of at least 140 lawmakers, notably congressional Republicans, to urge them to oppose privatization – and to warn of defections at the polls in a month if they don’t. Trump’s Office of Management and Budget long ago advocated privatization in the budget blueprint the president sent to Capitol Hill. The detailed plan is being drafted in secret by Trump appointees who gave only a cursory hearing to workers, mailers and virtually anyone who depends on the Postal Service. Trump and his right-wing backers think the USPS is outmoded in the age of e-commerce and that even if it survives, privatized, it shouldn’t have to serve every house six days a week, and seven for packages. Speakers in D.C. and elsewhere said that’s wrong. “For those,” like Trump, “who think the Postal Service is no longer important” in the age of e-commerce and Internet shopping, “think again,” Postal Workers President Mark Dimondstein told the D.C. crowd. “You have to have an infrastructure to deliver those letters and packages and medicines and parcels and holiday cards” and USPS has it. 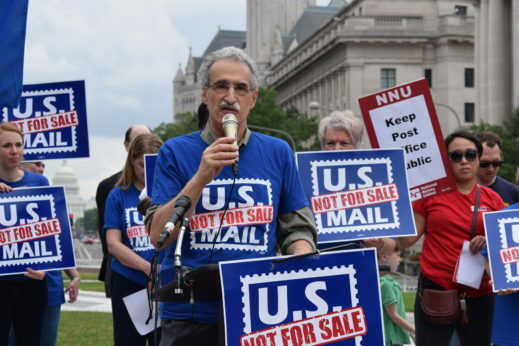 “If the Postal Service is sold off, people will – or will not – get their mail, so these guys can make a quick buck,” Dimondstein said of the privatizers. “It’s not profitable” for private firms “to go to Nome, Alaska and the bottom of Death Valley” in California to deliver the mail, added Rep. Brad Sherman, D-Calif. “You” – residents everywhere – “can’t be part of America if the Postal Service is hollowed out,” the Los Angeles lawmaker said. 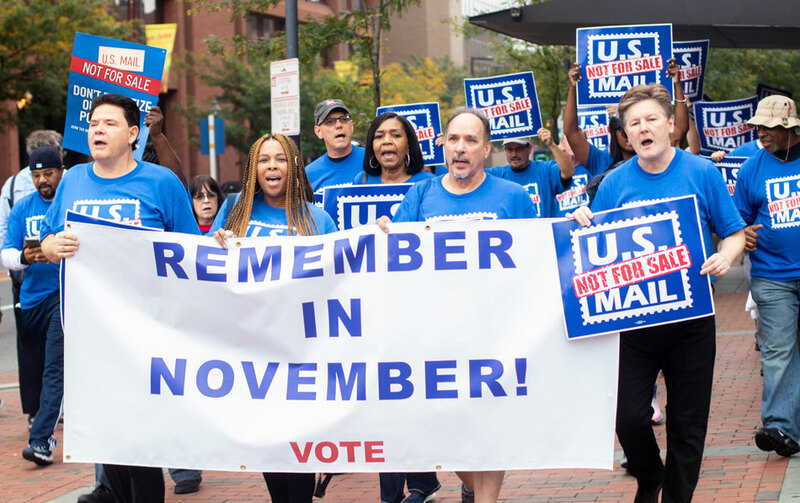 But the four postal unions and their supporters aren’t just taking to the streets, though Dimondstein noted the Oct. 8 rallies sent people to lawmakers’ offices. A non-binding measure, HRes 993, flatly opposing privatization, already has a bipartisan majority of 219 U.S. representatives as signers, and Dimondstein predicted more will join. A companion Senate measure, SRes 633, introduced by Missouri Democrat Claire McCaskill, has 41 of the 100 senators on board. What the unions and their allies want is not only to stop Trump’s privatization plan in its tracks but to put USPS on a sound future financial footing. The way to do that, said Ron Watson, NALC’s director for retirees, is to repeal the 12-year-old GOP-imposed requirement that USPS pre-fund future retirees’ health care benefits covering the next 75 years, now. That mandate dumps a $5 billion debit onto the independent agency’s books every year, throwing it deep into the red, even when USPS turns a multi-million-dollar profit on delivering the mail. The unions also want to let USPS enter other lines of business, such as basic banking – savings and checking accounts, for example – in unbanked areas of the country. 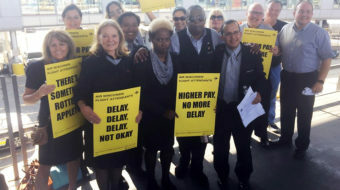 And speakers at the D.C. rally and elsewhere warned that lawmakers must listen to their constituents, who overwhelmingly – 88 percent – are satisfied with USPS as it is, a recent Pew Research poll says. “We don’t want the public service eagle” on the USPS logo “replaced by a vulture,” Dimondstein concluded.